Retail is a competitive business. Even if your product is completely unique, you still have competition. There is always another store down the road or online that is also aiming for your customers’ dollars. The days of running a traditional family business lacking any real commercial sophistication are almost over. How you present your store is a very strategic aspect of your business. In a world where you can find identical merchandise in multiple stores, layout and presentation have become key differentiating factors. Going the extra distance with your displays and merchandising can not only impact immediate sales, but can also help you create a unique identity and ambiance that will contribute to building yourself a loyal clientele. Don’t fall into the trap of viewing merchandising and displays as frivolous extra expenses. This is especially important for small business owners who are just starting up. Today’s competitive retail environment means that retailers cannot afford to consider merchandising as ‘frills’. There are more choices out there for consumers than ever before, so retailers must continually work at capturing the consumer’s attention. After invest money on important priorities such as a high traffic location, great merchandise, quality staff, insurance and advertising, your financial success depends upon whether or not your store measures up to customer expectations. To keep the customers from walking right past your door it is essential that merchandising and displays have a reasonable budget allocated. If you are on a shoestring budget start small, but make sure you include a plan for growth. You don’t necessarily have to revamp the entire store; rotating merchandise, updating displays, and changing signage makes customers feel that your store always offers them something new. The main purpose of visual merchandising is to create a logical and visually pleasing environment that will capture consumer attention and translate into increased sales. Retailers must create an environment that attracts the customer, is comfortable to shop in, and encourages the customer to return. The basics of visual merchandising include a clean, well lit store, with products displayed in orderly groupings. However, visual merchandising delves a lot deeper, focusing on the psychology and motivations of the target customer. Your entire store concept must be built around your target customers. You can have the most unique and creative store on the planet, but if it isn’t consistent with what your customers desire and expect, then the effect will be lost. Visual merchandising requires analysis and planning. Before you begin adjusting the design, display and merchandising of your store, you must have a clear understanding of the image you wish to project, and understand the demographics of the local community. What age groups are represented? What is the average income? What lifestyle do they currently live and/or aspire to? What interests them? Identify the type of individual you hope to appeal to and work out the best way to attract them. Look at competitors within your market to see if there is a void you can fill. Whatever approach you take, understanding who it is that you are appealing to and the message you wish to convey to them, will make your displays more effective and easier to create. Visual merchandising begins outside your store. Posters covering the door and windows, hand-written signs, bad lighting and shabby displays send the message that your business isn’t serious. If your store looks bargain basement, customers will expect bargain basement prices. Poor presentation may lead customers to assume that your product is poor quality as well. Your storefront must build your image and tell the right story about who you are as a retailer. Take a look at your storefront and try to see it as the customer would see it. What do you notice? What is lacking? Make some notes on possible improvements you could make to better achieve the image you want for your store. Sameness and mediocrity are ubiquitous in most retail store designs today. There is a distinct lack of innovation and creative flair. Too many retailers look at a successful store chain, and then try to copy its look. If you can’t separate yourself and be better than the competition, you might as well just go and work for them. You must give the customer as many reasons as possible to shop in your store. If you look the same, or worse, than the competition, then the customer will be less attracted to your store. Displaying a variety of seemingly unrelated products together can create a comprehensive visual story. This type of merchandising communicates breadth of product and educates your customer about merchandise they may be unaware that you carry…. The experience of visiting a store should be comfortable, rich and have impact. Create a sensual experience in your store by paying attention not only to sight, but also to smell and sound. An inexpensive tin of paint can be used to paint your fixtures, touch up chips and keep things looking new. Use fabric or paper under or behind a display to provide an eye-catching backdrop. 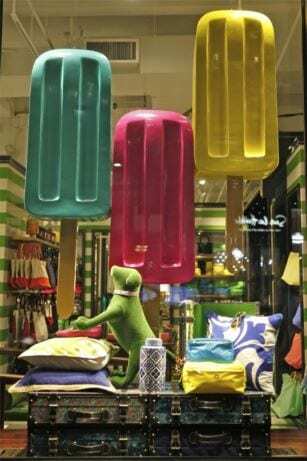 Are window displays creative, attractive & inviting? Are all senses appropriately stimulated? Is all signage clear and professional?